Announced December 30, 1958 and withdrawn July 14, 1969. The following is the text of an IBM Data Processing Division press technical fact sheet distributed on October 4, 1960. 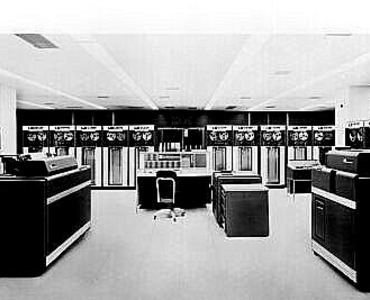 The solid-state IBM 7090 is the most powerful data processing system now coming off production lines at International Business Machines Corporation. The fully-transistorized system has computing speeds six times faster than those of its vacuum-tube predecessor, the IBM 709, and seven and one-half times faster than those of the IBM 704. Announced in December, 1958, the first 7090 was installed in December, 1959. Although the IBM 7090 is a general purpose data processing system, it is designed with special attention to the needs of engineers and scientists, who find computation demands increasing rapidly. As a scientific computing system, the 7090 will greatly speed the design of missiles, jet engines, nuclear reactors and supersonic aircraft. Four IBM 7090 systems are incorporated in the Air Force's Ballistic Missile Warning System, the 3,000-mile radar system in the far north designed to detect missiles fired at southern Canada or the United States from across the polar region. Two IBM 7090 systems are being used by Dr. Wernher Von Braun's development group at the George C. Marshall Space Flight Center of the National Aeronautics and Space Administration, in Huntsville, Alabama. These systems are key design and development tools in building Saturn, the free world's largest space vehicle. The 7090s are being used to simulate Saturn flights, achieve the most accurate and detailed trajectory simulations ever plotted, determine the effects of design modifications on an actual Saturn flight into space, and analyze vibration and heat transfer caused by interaction of the eight powerful rocket engines in the Saturn booster. The IBM 7090 will process such large-scale business applications as inventory control, production control, forecasting and general accounting. The 7090 is well-suited for IBM Tele-processing, which in its most advanced form uses a powerful computer as the data processing center of a network of decentralized plant and office input stations. An example is SABRE, an automatic, centralized electronic airlines reservations system developed by IBM for American Airlines. SABRE has two 7090s as its computing nerve center. Another IBM 7090 is solving problems for various customer companies at the IBM Datacenter in the Time-Life Building, New York City. The six-fold increase in the 7090's speed results largely from the use of more than 50,000 transistors plus extremely fast magnetic core storage. The new system can simultaneously read and write electronically at the rate of 3,000,000 bits of information a second, when eight data channels are in use. In 2.18 millionths of a second, it can locate and make ready for use any of 32,768 data or instruction numbers (each of 10 digits) in the magnetic core storage. The 7090 can perform any of the following operations in one second: 229,000 additions or subtractions, 39,500 multiplications, or 32,700 divisions. The IBM 7090 can use many programs (sets of instructions) already developed for the IBM 709 as well as hundreds of programs developed for the IBM 704. In addition, the 7090's input-output media are compatible with those of all IBM data processing systems. Personnel familiar with the 709 require no formal retraining to gain a technical knowledge of the 7090. The ability to read, write and compute at the same time is provided by the 7090's new Multiplexor. Up to eight input-output data channels may be handled by the Multiplexor. Each channel may have a total of ten magnetic tape units, a card reader, a card punch, and a printer. Therefore, a maximum 7090 system would include 80 magnetic tape units, eight card readers, eight printers, and eight card punches. The use of long-life transistors throughout the 7090 produces increased reliability and greatly accelerated speed of logical circuitry. Despite its great speed advantage, the 7090 takes considerably less floor space than either the IBM 704 or IBM 709. The 7090's construction provides a large reduction in power consumption and air conditioning requirements. The 7090's modular design eases maintenance and accessibility. Each unit consists of modular sliding frames with two vertical pullout racks. When the racks are drawn out from the frame, they may be opened to permit access to hundreds of transistor cards and test points. The IBM 7090, which is manufactured at IBM's Poughkeepsie, N. Y. plant, sells for $2,898,000 and rents for $63,500 a month in a typical configuration.